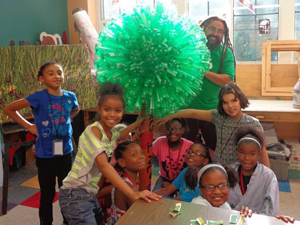 In a residency with Bart Vargas, students will be introduced to building sculptures with recyclable materials. His residency activities can be adapted for all ages from K-adult. In his workshops, Bart will utilize simple, everyday materials to construct individual or collaborative sculptures or site-specific installations. Students will learn about the creative potential of common, everyday materials often taken for granted. Bart is from Bellevue, Nebraska. He received a BFA from the University of Nebraska at Omaha and MFA at the University of Minnesota - Twin Cities. He has exhibited nationally and internationally, and his work can be found in many collections throughout the United States, Europe and Asia. His works have also been featured in many publications including Sculpture magazine, New American Paintings and HGTV Magazine.